You are here: Home / Blog / Uncategorized / How Much Force Can Your Deadbolt Withstand? If you are a homeowner, you have probably heard the word deadbolt thrown around several times. Most likely in reference to a lock you have, or should have, on your doors at home. If you’ve always wondered what a deadbolt is, or why they are so important, you are about to find out. Deadbolts are a staple of home security and they work tirelessly to keep families and communities safe. Unfortunately there are some homeowners who aren’t concerned about security, so they settle for the cheapest locks they can find. Even if you have heard of deadbolts before, you probably do not know too much about them? Let’s take a quick test, shall we? How many types of deadbolts are there? How many grades of deadbolts are there? Can a child that weighs 70 pounds break down a door that is secured with a deadbolt? These are important questions that professional locksmiths ask themselves every day, but the average homeowner has probably never even stopped to contemplate these, let alone found the answers. For homeowners that have wondered about these things, today is your lucky day. Let’s break into the world of deadbolts as we learn and explain what they really are, the basics to a deadbolt, and answer the question to how much force your deadbolt can withstand. Can your deadbolt stand up to an Alaskan Malamute Husky Dog? Can your deadbolt stand up to the weight of 247 wigs? Let’s find out! A deadbolt is a locking mechanism that is that is engaged by the turning of a key to extend or retract the bolt. The deadbolt differs from the spring bolt lock, which it is often confused with. A deadbolt does not require the action of a spring for the bolt to move. The bolt of the lock is meant to extend into the strike plate on a corresponding door frame. Single cylinder deadbolts are the most common type of residential deadbolts used. It is important for homeowners to figure out which deadbolt and which trusted lock brands will work best for their home. For instance will the August smart lock be a better choice for you than the Mul-T-Lock MT5+ Hercular double cylinder deadbolt? Why are deadbolts important for home security? Deadbolts play a crucial role in home security because they provide a more secure means for locking doors than other locks that exist on the market. These locks are much harder for criminals and burglars to bypass due to their unique locking mechanisms. However, homeowners should not be lulled into thinking that if they have a deadbolt on their door that they will have nothing else to worry about and that all their security needs are taken care of. When it comes to home security, your deadbolt is just one part of the equation and the door to your home and your other security measures are the rest of the equation. These aspects of your home security need to be working in tandem in order to make sure that your home is kept as secure as possible. These locks prove to be much more resistant to bypass methods than other forms of locks. This is not to say that they are invincible locks, but they will make your home a lot harder to get into without the proper form of access. As was stated earlier, there are several types of deadbolts that homeowners can choose from to fit their security needs. These deadbolts range from single-cylinder deadbolts to double-sided deadbolts with no outside trim. Keep in mind that even though these locks are deadbolt, not all of them will make the greatest security addition to your home if they are used to secure your front door. In order to make sure that you are maximizing the efficiency and strength of your deadbolt, you need to use the right one at the right place. The most commonly used deadbolts generally have the same basic features. These features consist of the bolt mechanism, the strike plate, the outer trim and the inner trim. 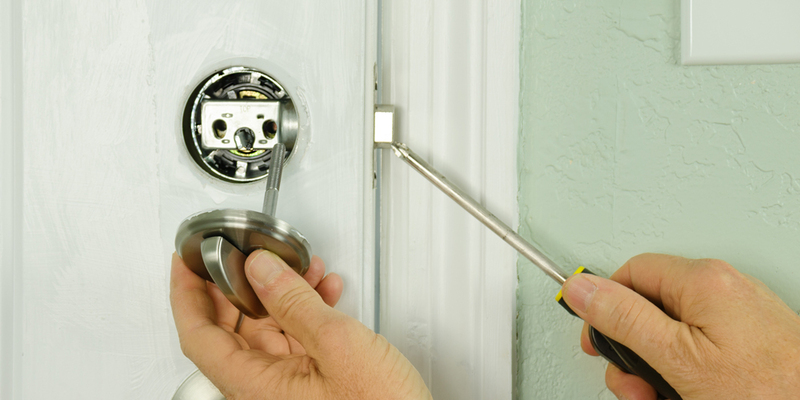 Single cylinder deadbolts are the most common type of deadbolts that homeowners make use of. If you take a mini field trip around your neighborhood to see the kind of locks that your neighbors are using, you will probably find that a majority of them have single-cylinder deadbolts installed somewhere in their homes. Although it might be slightly creepy to walk around checking people’s locks, so don’t do that unless you’re extremely popular in your hood. These deadbolts require the use of a key on the exterior that is meant to retract the deadbolt from within the door jamb when the lock is engaged. Double cylinder deadbolts have a keyed cylinder on both sides of the lock. Some homeowners opt to use these to locks because they believe it provides much more security. If a burglar was able to reach their hand through a nearby window and unlock your deadbolt from the inside,that would be unfortunate. The double cylinder deadbolt lock prevents this from happening. However, if a burglar was able to reach their hand into your home, there is a high chance that they will find another way in. Double cylinder deadbolts might be extremely secure, but they also pose a specific danger that mitigates their advantageousness. Double-cylinder deadbolts have sometimes been cited as fire exit hazards. In some states, homeowners are not allowed to use these locks because they go against building code. It is not advised that this lock is used on any type of fire exit because of the potential danger that it poses. There are many people who advocate that double cylinder deadbolt locks should no longer be used on residential properties because they believe that the inherent danger far outweighs the benefit. One sided cylinder deadbolts, with an outside trim, are commonly used on back doors of restaurants, homes, and small businesses. They are mostly used when there is no need to unlock the door from the outside. The deadbolt can only be operated from the interior when these locks are installed. On the exterior section of the door, there are plates that are put in place to cover the exposed section of the door. This kind of deadbolt lock is not normally a staple of residential homes because homeowners usually access their back doors. However, it might make for a good security addition if a homeowner did not frequently use this backdoor. This would essentially give burglars and criminals one less likely way to gain access into your home. These doors are pretty much the same as the ones discussed above, except that the exterior side of the door lock will most likely not show any signs that there is a deadbolt affixed to the door on the inside. This type of deadbolt lock is best used on doors where the borehole does not go through the entire door. Essentially if someone walked up to the exterior section of your door, they might be greeted with a knob lock, without knowing that there is an additional lock on the other side, or they might be greeted with nothing at all. The one sided deadbolt with no outside trim might be a good addition to home security because it will not alert a burglar to the fact that you might have a deadbolt installed on the other side of the door. In effect, you will waste their time and frustrate them, which will hopefully help exhaust their efforts of breaking into your home. Deadbolts are classified into 3 grades, that rank from Grade 3 to Grade 1. Grade 1 deadbolts are the strongest type of deadbolts available. Deadbolt grades are determined by the American National Standards Institute (ANSI). 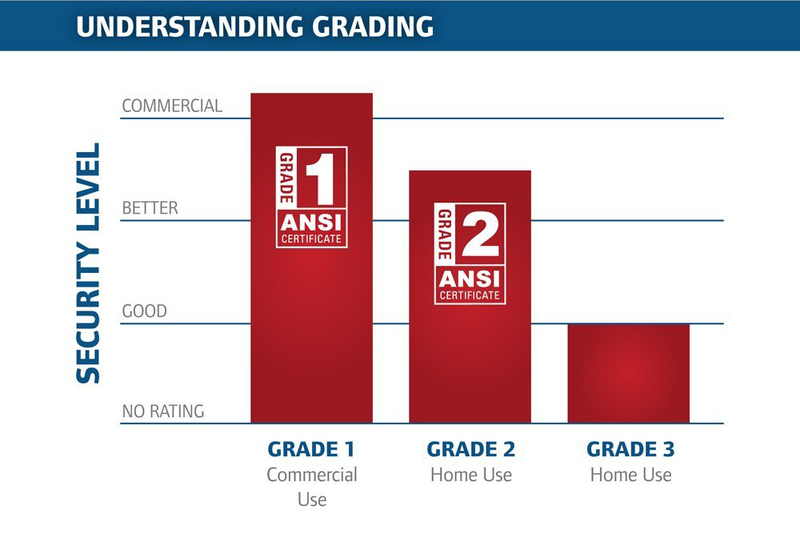 The grading system that the ANSI uses was first instituted and developed by the Builder’s Hardware Manufacturers. In order to determine the grade of the deadbolt, the strength of the lock is weighed together with its longevity and the length of the latch bolt. These factors come together to help determine just how strong a lock might be. Grade 3 deadbolts are the lowest on the rung, but they are still much more secure than Euro cylinder locks or deadbolt locks that have not been graded. Grade 3 locks are not the go-to option for primary security but are instead a cheaper backup option for homeowners who already have Grade 1 bolts installed. If they are used in conjunction with Grade 1 and Grade 2 bolts they provide a good amount of security. Grade 3 locks are manufactured to endure approximately 800,000 rotation cycles. The rotation cycle refers to the act of the bolt being thrown and retracted in order to operate the lock on the door. So in plain English, these locks are built to be unlocked roughly 800,000 times before they begin to wear down. In addition to this, they are built to stand up to 2, 75-pound, strikes against it, or 1, 150-pound, strike. Essentially, if someone took a bag of 300 apples (which would approximately weigh 75 pounds) and banged on your door twice, they would be able to demolish your Grade 3 deadbolt. I doubt anyone would want to lug around a bag of 300 apples but you get the point. In addition to the rotation cycle and the force that they can withstand, Grade 3 deadbolts also have latches that are approximately 0.625 inches or ⅝”. Grade 2 deadbolts are next up on the list in terms of strength and they provide a level resistance that is higher than Grade 3 bolts. Grade 2 deadbolts are probably the most used type of deadbolt on residential properties. This is normally attributed to the fact that they are cheaper than Grade 1 deadbolts but much more effective and long lasting than Grade 3 deadbolts. These locks are considered mid-range, in terms of the security that they provide as well as their longevity. Grade 2 deadbolts are manufactured to endure the same amount of rotation cycles as a Grade 3 bolt. However, the stark difference between these two locks is that Grade 2 deadbolts can withstand more force than Grade 3 deadbolts. Grade 2 bolts have been tested to withstand up to 5, 75-pound, strikes. If the example of the bag of apples does not put this into context maybe another example will. In order for your Grade 2 deadbolt to be compromised, 1,440 AA batteries will have to be thrown at it 5 times for it to begin to even show any sign of wear and tear. This is a lot more resistance than the Grade 3 bolt and it helps deter burglars who don’t want to draw attention to themselves. Grade 1 deadbolts are the cream of the crop and they are the most effective deadbolt that can be used on a residential door. This is also the reason that they are the most expensive among the deadbolt grades. These type of deadbolts are also popular among residential homeowners, renters, and small business owners. They are the go-to option for people that are more security minded and are intent on giving their property the maximum amount of security that they can afford. Grade 1 deadbolts are manufactured to endure approximately 1 million rotation cycles. In some cases, this number is much higher, especially if the manufacturer set out to make a high-security lock. Also, the Grade 1 deadbolt locks have been tested to withstand a minimum of 10, 75-pound, strikes which are reported to be the equivalent of over 100-foot pounds. Essentially a burglar (even a really strong one) would have to kick your door over 100 times for it to even begin to deteriorate or show signs of weakness. In order to put this amount of force into context, let us draw upon one more illustrious example. For your Grade 1 deadbolt to begin to show signs of weakness, 5 high-performance racing bicycles have to be crashed into the door. Grade 1 deadbolts also feature latch bolts that are 1” or longer. These deadbolts are meant to afford homeowners with premier security and this the way they function at a bare minimum. It is important to remember that these locks can always be improved by the kinds of additions that homeowners make around them. For instance, a Grade 1 deadbolt can become even more resistant by utilizing longer set screws, longer latch bolts or simply installing additional Grade 2 deadbolts around the deadbolt that you have in place in order to maximize its potential for resistance. Deadbolts are important, yet sometimes underrated, additions to any home and they will help increase the level of your home security, but only if they are employed in the right manner and at the right place. Think of deadbolts as the really big guys that play defense on football teams. They are trained to stand against the force of things hitting against them day in and day out, and they are meant to stand their ground and stand securely. There is probably no chance someone will attempt to hit your door with 4,037 gumballs (which approximately weighs 75 pounds) to try and break it down, but in the event that they do, you want to make sure that you have a deadbolt in place to try and stand against it. In conclusion, deadbolts are able to withstand a lot of force that is exerted against them. Obviously, they can not stand up to the same amount of force as bank vaults, but they will stand up to any burglar that attempts to kick your door down. It is important for homeowners to view their security holistically to see which kind of deadbolt locks will be the best fit for them. Hopefully this will stop homeowners from buying the wrong locks at home depot, then again, why are you even in the Home Depot? https://mobileamericanlockservice.com/wp-content/uploads/2018/11/deadbolt-withstand.jpg 500 1000 mobilelock https://mobileamericanlockservice.com/wp-content/uploads/2018/10/new-weblogo-300x99.png mobilelock2018-11-23 19:56:062018-11-25 19:57:02How Much Force Can Your Deadbolt Withstand?